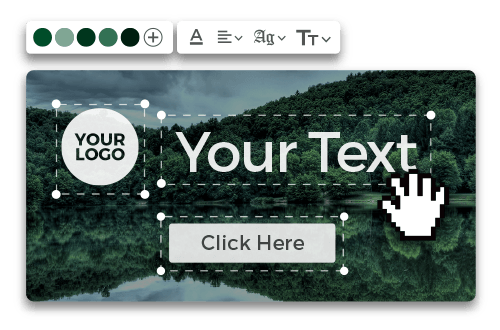 Login into the platform, select the template and the size you need for the Facebook cover photo, Facebook post image, Facebook profile image, Facebook ad photo or whatever social media image you need, personalize it, and download or share it directly on your social accounts! CREATE YOUR OWN AWESOME FACEBOOK IMAGES, EASILY! Here you will find the optimal Facebook image sizes to share on your Facebook accounts, so you can properly display them on all devices. With this effortless image creator, make your own Facebook post images in seconds with the correct size and share it directly to your social accounts. Make sure that your Facebook group cover is the perfect size and will be the perfect size in all devices as you create your own cover with this template. Design your Facebook event cover image on your own, in 3 simple steps: click on “Create”, select or add the image and type the text of your choice. Then, just download it. Create the perfect ad! Selecting this canva you can edit the ad image and text, making sure that the size is correct for Facebook. Select this Facebook cover template to create the perfect cover for your Facebook page, so it will display correctly on all the devices. Create the images of your Facebook stories with the appropriate measures so that they are displayed correctly on all devices. Show your products for sale in the best way with the measures Facebook requests. Images are essential in order to shake your audience thanks to their visual traits. Attractive colors, impressive outlooks, and relevant texts impact your audience. Today we will take a look at how to do this! Here you will learn to positively impact your audience by using images. You will discover exactly why they are vital to your Social Media strategy and what the required images are used for in order to obtain the best quality for Facebook. And we will finish by giving you the 3 fundamental tips for getting the most impactful images on this social network. How Should I Use Facebook Images? ● Avoid offensive, obscene, discriminatory and violent images. Images with these types of contents are deleted by Facebook and you run the risk of getting banned from ever publishing on the network. ● Respect ethical boundaries: Facebook is all about friends sharing experiences. Respect each other and avoid publishing contents that can offend someone, a culture or a religion. ● Protect your intellectual property: If you are on Facebook, you accept and “promise” that all images are shared and owned by you. So, create your own images, especially in your business account, and respect copyrights, trademarks, and other legal rights. ● Achieve the much sought after Stopping Power, meaning your public can't avoid pausing in the incessant flow of publications just to see what your post is all about. ● Build a favorable image for your brand: when you share a high-quality image (attractive, informative, funny or educational) your audience associates this with your business which builds a good reputation and also conveys positive values. ● Retain your audience: when you share top quality visual content, your audience values that, since it's not taht common to find good-quality content on Facebook and other Social Networks. These top quality images will make you stand out. What Are the Benefits of Correctly Publishing Images on Facebook? How Will It Help Your Social Media Strategy? Note: Given that Facebook is the largest Social Network that has people from all different backgrounds, it's important to identify and define your target audience. Knowing your audience enables you to effectively increase your image on Facebook. Why? Because if you know their average age, social status, and habits, you will be able to select best images for this specific group. ● Facebook Profile picture:	500x500 pixels. ● Facebook Fanpage Profile Picture: 180x180 pixels. ● Facebook Profile Cover:	851x360 pixels. ● Facebook Fanpage Cover: 820x360 pixels. ● Facebook Groups Cover: 851x360 pixels. ● Facebook Events Cover: 500x314 pixels. ● Facebook post (Standard): 1200x628 pixels. ● Facebook post (Square): 1200x1200 pixels. ● Facebook post (Vertical): 1000x1300 pixels. ● Facebook Story: 750x1334 pixels. ● Facebook Ad (Standard): 1200x628 pixels. ● Facebook Ad (Carousel):	1200x1200 pixels. The goal is to make a difference with your photo. Whether it ends up being informative, educational or brings a smile to your audience, the goal here is to make people feel like your pictures are worth seeing and sharing. This is about being honest with your audience: if your link takes people to a car sales dealership, don't post it with a photo of girls in their bathing suits. This only misleads your audience and your link could be considered as spam . Whether your photo was touching, funny or informative, the goal is to get people to share your photos with their contacts. This will maximize your exposure and build trust with your audience. In order to do this, we recommend that you analyze which of the images you shared on Facebook receive the most Likes, Shares and Comments from your audience in order to generate more similar contents.